There are no clouds, just data centres. 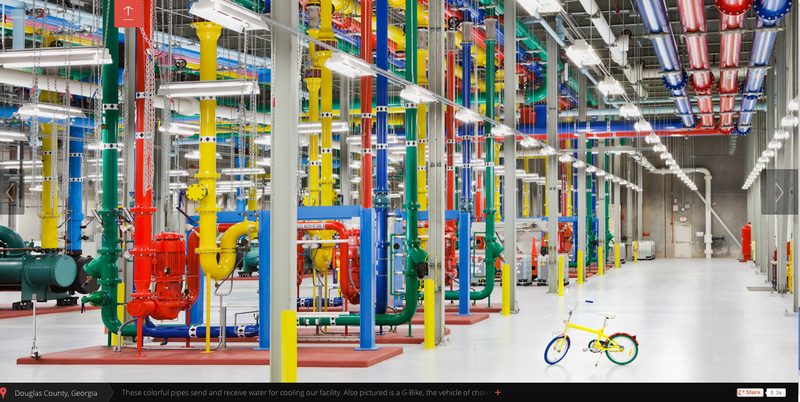 But suddenly they tickled the science-fictional nerve again when Google released its “inside view” to their factories of data: it has colours! The rather glitzy pictures showed this seeming transparency and the spatial sense of data management. Besides space, it’s about the elements. Air, water plays a crucial role. In a great phrase in Andrew Blum’s book Tubes, a Facebook data centre manager (Ken Pratchett) sums it up: “This has nothing to do with clouds. It has everything to do with being cold.” Cool, cold data is not just a linguistic or visual metaphor, despite that elegant modernism that still lives inside the architectures of data places: Mondrian as data. Instead, it has to do with climate control. Ecology. Air. Coolness is not a media theoretical attitude in this context but a media management issue that ties the earth to the escape velocity of data. It’s important to notice the persistence of issues of ecology from air to the soil as well as non-cognitive work: that we still talk of factories and rather physical processes having to do with our hardware and how we manage and work with data in its material level. A different sort of steam punk for the 21st century. Dear Jussi, how about a book on metaphysics? I like this quote a lot. I should have adopted it as the slogan of my blog! I wonder what interesting metaphors might come out of the concept of geographical redundancy, relative to these data centres. Sure clouds are actually data centres … but what makes a data centre ‘the cloud’ is that the data they store doesn’t know that it is there … and it is most very probably also somewhere else. I’m not sure how to express it … its a kind of geographical agnosticism. Its closer to how stored energy functions. Doesn’t matter where the energy comes from, or where it is stored … it is on tap. Ditto ‘the cloud’. It represents a logical separation from geography, but not a physical one … yes that’s it. A logical separation, not a physical one. I wonder what else functions like that. That book looks very interesting. I’ll have a deeper look. I haven’t dedicated any thought to the notion of waste, relative to digital media. What springs to mind, however, is that there is perhaps a relationship between abstraction, and waste. I wonder if waste generated can be seen as a function of abstraction, a concept fundamental to the building blocks of the digital medium. It would be quite amusing (for want of a better term) if it could be demonstrated that logical abstraction increases physical waste! If so, the purported efficiency and other benefits of de-centralised digital systems would be demonstrated to be burying the planet.